Following the snow day on Feb. 2, I woke up the next morning and looked out my window only to see that my street was still covered in a thick blanket of snow. With a heavy sigh, I began to put layer after layer of clothing on in preparation for my commute to Mac. As I walked to the bus stop, I breathed a sigh of relief when I noticed that the majority of my neighbours had shoveled their sidewalks, including my 84-year-old next-door neighbour. There would be no need for snowshoes today, I thought, but I was wrong. When I finally arrived on campus, I stepped off the bus and wound up ankle-deep in snow. In life, you are rarely presented with such a terrific opportunity to develop the fluency, creativity, and duration of your cursing. After I concluded my symphony, I began to wonder why it was that my neighbour, at the age of 84, was able to clear his whole sidewalk on his own, while my university, complete with an entire Snow Response Team (yes, that’s an actual thing), was not. With a heavy heart, I continued my arctic expedition to my first class of the day. As snow continued to fall, I noticed two small snow ploughs clearing University Avenue. I stopped for a moment to watch the elusive Snow Response Team in action. Continuing my trek to class, I tried to stay on the pathways that had actually been cleared, but they were few and far between. When not on a cleared pathway, the combination of heavy snow, slush, and icy ground made it difficult and dangerous to walk on. When I finally got to class, I couldn’t help but think about how difficult it was for me, an able-bodied individual, to get around in the snow. I started to wonder how the students or faculty with disabilities managed to get to class in such conditions, and that was when I realized that some of them hadn’t. I looked around the room and noticed that one of my classmates who uses a powered wheelchair wasn’t in class. This may have been a coincidence, but it got me thinking about how accessible campus really was. Over the last few years, McMaster has actively worked to make buildings on campus more accessible on the inside and out. Over the past summer, for example, the Campus Store underwent heavy renovations, resulting in a new ramp, which made the store wheelchair accessible from the outside. Similar renovations can be seen all across campus. However, while proposing new ways to make McMaster a more accessible environment is obviously important, fancy new ramps are absolutely useless when they’re covered in a foot of snow. Even several days after the snow day, the ramp to the campus store and several other ramps across campus had still not been cleared. 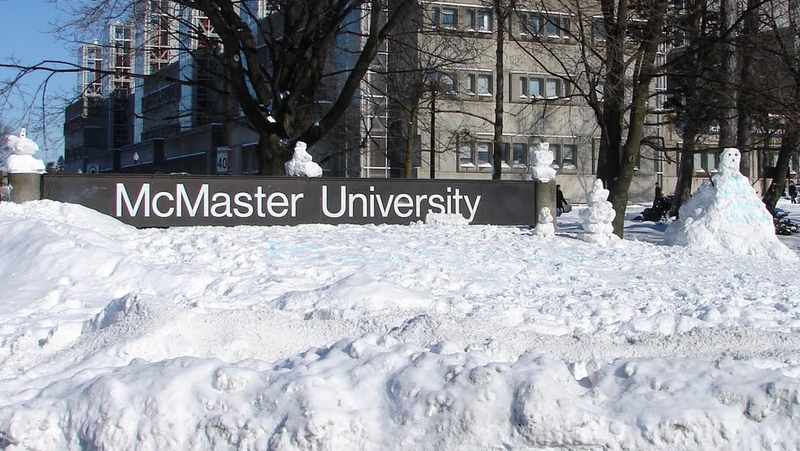 You would think that if the entire city of Hamilton was so overwhelmed with snow that McMaster University finally decided to declare a snow day, the Snow Response Team would spend that time ensuring that the university was clear of snow, allowing campus to be safe and accessible. Dumping bags of salt on snow, rendering the pathways a slushy wasteland, does not count as making campus safe and accessible. If my salt-encrusted boots cannot safely navigate through campus, neither can wheelchairs, walkers, crutches, or canes. If a student cannot attend a lecture because the Snow Response Team failed to make campus accessible, it is the job of the university to reform the snow removal procedure. Whether this involves making room in the budget for more snow ploughs or a full reorganization of snow removal procedures, something needs to change. A student should not have to suffer academically because their university failed to make campus accessible. Should the Snow Response Team ever find itself overwhelmed, the university should close until campus can be made safe and accessible for all of its students.